Status: Classified by the National Trust. This two-storey house (to the west of the Church) was built by Reuss. 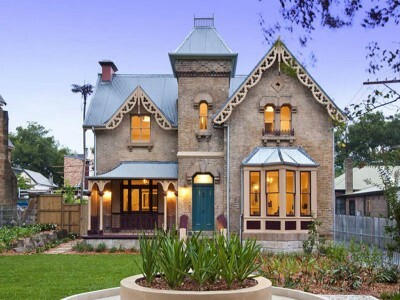 It is one of the most interesting and original of the picturesque Gothic houses still standing in Glebe. It is a sandstone and brick residence, with a central tower, fretted barges, a ground-floor bay window, stone carved lintels, and a slate roof. It served as the Presbyterian Manse until 1965, after which it fell into disrepair despite its heritage status. Reussdale has recently been restored and sold. It is now in private hands. Imagine, for a moment, this busy road free of motor vehicles but with horse-drawn vehicles making their way over a road surface which was something rather more problematic than the modern one. Originally Pyrmont Bridge Road was built by the Pyrmont Bridge Company (of which solicitor George Allen of Toxteth Park was a director) as a private toll road leading to their bridge over Darling Harbour, opening up a main route to the city from inner western suburbs. The shorter name Bridge Road has been used since about 1895. The pattern of the 19th century development was for the larger houses to be built on main roads with small cottages and houses in surrounding streets. Thus Bridge Road contains large houses and substantial terraces (many of three storeys) reflecting its prominence and former high status as a residential area. The Hermitage at 154 Bridge Road is another handsome residence built by Ferdinand Reuss where he lived from 1866 to his death in 1896. Other Reuss buildings include Alma Villa (No 158) which was demolished for the church in 1927, and Mon Repos (No 177) on the other side of Bridge Road. The original Hereford House (1829) stood in the grounds of what is now Foley Park. But the section of Bridge Road, just to the west of Glebe Point Road, remains a largely intact 19thC streetscape. Definition: Barges (or barge boards): an overhanging board along the projecting sloping edge of a gable roof. Definition: Lintel: a horizontal supporting member above an opening such as a window or a door.